iSEEK is the search engine of the American Vantage Labs, which offers web-based solutions for the education sector. According to ISEEK, it uses linguistic, conceptual and AI technologies. The results page offers various options for refining results, e.g. by source, date or topic. Overall, however, the database appears to be rather small for "Sand" there were 49 results and for "Library" there were 58. At the same time, the results are only a few days old, which should probably keep the index up to date. 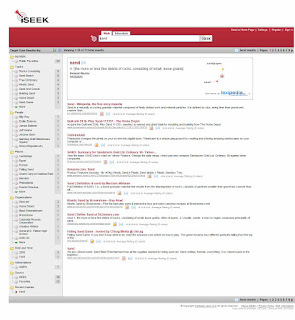 In addition to the web search, iSEEK offers a medical and academic search engine and one for business topics. Bloomberg: »Company Overview Vantage Technologies Knowledge Assessment, LLC, doing business as Vantage Learning, provides educational and commercial Web-based solutions for students and teachers worldwide. It offers Vantage Accountability Solution, a management solution to monitor school objectives, teacher effectiveness, and student progress. The company’s Vantage Accountability Solution includes iSEEK Supercruncher that enables teachers, school administrators, and district administrators to interact with their data, save, export, and share results; Student Progress Monitoring System, a Web-based platform that conducts cross-curricular student skills assessments using computer adaptive testing; MY Access! School Edition, a Web-based instructional writing and assessment program; and Real-Time Professional Development Department, which provides teachers with opportunities for practice, observation, feedback, coaching, and best practices modeling. It provides Vantage Fusion, a school intelligence system that stores, manages, and reports on data relating to students, parents, facilities, teachers, vendors, transportation, counseling, health/nursing, library information, HR/finance, fee management, and district-wide learning management; IntelliMetric, an automated essay scoring solution to conduct attempts at writing assignments; and custom solutions and consulting services, including testing services and educational technology solutions. iSEEK™ About Us (2007): »The world isn't flat, and the web isn't either. So why is your search? At Vantage Labs, we wanted to use our advanced linguistic, conceptual, and AI technologies to make web search better - more relevant, direct, productive, and intelligent. But what we built isn't just a search engine at all. By making "web searches" more intelligent and intuitive, we left "searching" behind... and now offer you Targeted Discovery, the new era of information retrieval on the web. Why iSEEK and Targeted Discovery? Target Information You Want with Relevant iViews and Results. Through our iView technology, you can	dynamically and instantly target results that are relevant to you. iSEEK analyzes your search results each time you do a query, identifying themes, topics, and more and organizing your results for	you. Rather than wading through a mini-web of thousands of results, one by one, in some indiscernible order, you are guided to a specific set of relevant results with iViews. Discover New and Useful Information with Intelligent iViews and Results. iSEEK brings results to life, letting them tell you what they are about. Analyzing every set of results on-the-fly, iViews draw out topics, people, places,	dates, and more from your results. You discover new facts and connections before even clicking a link. Make Searching Simpler with Natural Language Queries. In iSEEK, you can use natural language to do your searches. Instead of relying on keyword pattern matching and algorithms, iSEEK knows the meaning and concepts embedded in the questions you ask, so it understands what you are asking and retrieves relevant information. No more strategically selecting keywords then adding to them, revising them, and requerying them to get the results you want - simply ask questions and get answers. Easily Target Authoritative Results for your Professional or Personal Needs with Searchblades.